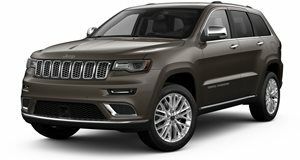 With prices ranging from just over $30k to well over $65k, there’s a Jeep Grand Cherokee for everyone. Topping the range are the SRT and Trailhawk editions, but these target a niche group who value performance over anything else. For everyone else, the Summit is, as the name implies, the highest trim level. Its the uber-luxe Jeep for those wanting more than the Overland provides. Until the Grand Wagoneer returns with a price tag north of $100k, those who demand luxury and style from their giant Jeep have this. So where better to spend time with the SUV then in the glorious surrounds of northern Italy. Collecting the car from the style capital of the world, the handsome hulk finished in Bright White was waiting for me at Milano Motor Village, where it shares space with its Italian cousins, Alfa Romeo and Fiat. The Summit is instantly recognizable thanks to its unique front fascia sporting a revised grille and lower chin. But it’s the warm welcome from the illuminated ‘Summit’ door sills upon entering the car and the Morocco Black Natura Plus perforated leather-trimmed seats that really gives this away as the top trim model. An optional $4,995 Signature Leather-Wrapped interior package is worth considering if you have a penchant for being wrapped in swathes of thick, soft leather. The standard fitments, including piano black wood and chrome trim, do a decent enough job elevating the interior if you don’t. As standard, the Summit features a suede headliner, acoustic glass, soft carpets, a superb 19-speaker Harman Kardon premium audio system, heated/ventilated front seats, keyless Enter-N-Go, a leather and wood steering wheel and a panoramic roof. This is about as close to an American Range Rover as you can get. After loading half a dozen bags with room to spare, and familiarizing myself with the controls and intuitive touchscreen, I hit the highway, paid the first of many, many tolls, and headed for Turin. In Italy, the Grand Cherokee Summit comes exclusively with the 3.0-liter Multijet II direct injection turbodiesel, rated at 240 horsepower. Four-wheel drive comes as standard on the 2017 Summit, as does the eight-speed automatic fitted to all Grand Cherokees. Given I was set to embark on a 2,000-kilometer road trip in a country where gas costs almost $6 per gallon, not having the choice of the Pentastar V6 or 5.7-liter Hemi V8 was probably a good thing. Effortless highway cruising, elevated ride height providing a decent vantage point from which to admire the beautiful countryside, cocooned in a bubble of leather and loud music, highway driving from Milan to Turin and later from Turin to Finale Ligure–a truly breathtaking stretch of road–through the endless tunnels that links the Italian Riveria, from Pisa to Florence and from Modena back to Milan, the big Jeep was a pleasure to pilot. Passengers were equally impressed. Despite doing a fantastic job at keeping my two feisty sons sedated during long stints of driving, at $1,995, the rear seat dual screen Blu-Ray/DVD Player is an expensive optional extra. Probably wiser to invest in a couple of tablets and wireless headphones. With 420 lb-ft of torque and Jeep’s superb Quadra-Drive II four-wheel-drive system at my disposal, making the ascent to the Forte di Fenestrelle, an enormous 18th century mountain fortress, and criss-crossing the spectacular Cinque Terre, the Jeep delivered power on demand. On the flip side, its considerable bulk was less than ideal when slaloming down mountain roads with just enough width for a couple of Cinquecentos. With roads better suited to little city cars and racy convertibles, large SUVs aren’t the most popular body type in Italy. The Renegade, rightly so, has plenty of fans in this part of the country however, especially around Turin, home to footballing giants Juventus who proudly wear the Jeep name on their shirts. The oversized American ambling through the unfamiliar city streets of Milan, Pisa, and Florence certainly caught the eye of a few locals (for all the right reasons) and looked downright menacing when parked up next to more diminutive homegrown offerings. Doubtless a few will make enquiries into the car, but how many will be able to stomach its price tag of over 70,000 Euros? It’s not exactly cheap in the US either, but in Summit trim at least, the Grand Cherokee is a properly premium machine. Jeep has every intention of pushing the premium envelope even further, taking Range Rover head on with the Grand Wagoneer. I have every confidence it will succeed in that endeavor, its new Chinese owners permitting of course.